The recipe will 2 large or 4 smaller pancakes. 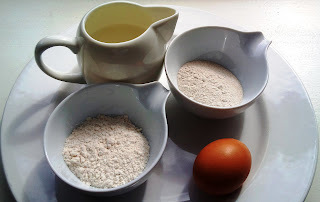 Sieve the flour into a large bowl and make a well in the centre. Crack the egg into the milk and whisk gently to combine. Add about a third of the egg/milk mixture to the flour and whisk slowly in the centre of the bowl drawing the flour down from the sides. Add another third of the egg/milk mix and continue to whisk, again drawing the flour down to thicken the batter. Add the rest of the egg/milk mix and continue to whisk for a further minute or so until the batter is smooth. Transfer to a measuring jug and chill until you're ready to make the pancakes. (For a minimum of 30 minutes). To make the pancakes, heat a large frying pan over a medium to high heat and add 2-4 sprays of oil per large crepe, 1-2 per small crepe. 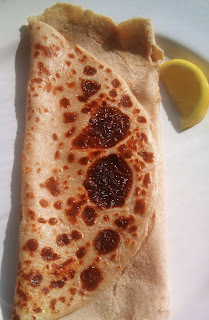 (A small frying pan works better if you are making smaller sized crepes). Remove the batter from the fridge and stir to ensure no lumps have formed. Add the salt and pepper or sweeteners as appropriate. Pour half the batter into the pan if making 2 large crepes (or quarter of the batter if making 4 smaller ones) Swirl the batter around to ensure it fills the pan. 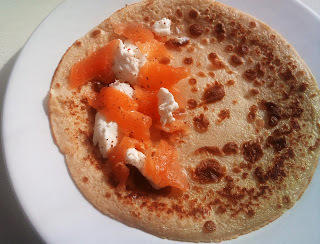 Cook for 2-3 minutes and then turn the pancake to allow the other side to cook for a further minute or so. Remove to a warm plate and continue with the rest of the pancakes. (Alternatively, you can keep them warm in an oven on a low heat until your ready to serve.